Topics: Hdmi Cables, Audio Cables, and Switches & Splitters. Age: It went live on January 15th 2004, making it over 14 years, 3 months old. 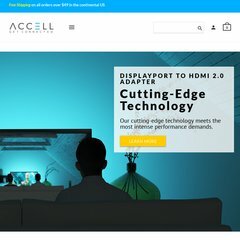 accellcables.com ACCELL Cables - Audio, Video, Speaker, Computer Cables and .. The site has about 374 users daily, viewing on average 3.10 pages each. ns2.dnsjunction.com, and ns1.dnsjunction.com are its DNS Nameservers. The Endurance International Group Inc (Massachusetts, Burlington) is the location of the Nginx server. Its IP Number is 66.96.145.105. PING www. (66.96.145.105) 56(84) bytes of data. A ping to the server is timed at 41.2 ms, and the average page load time is 755 milliseconds.